MUSAT.IncSouth Korean UDT/SEALs engage in knife training aboard a ship in the Gulf of Aden. 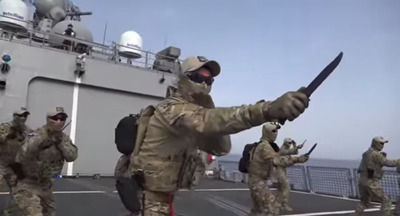 South Korea’s elite unit of frogmen have longstanding ties to US Navy SEALs, but some of their techniques, like a recent video displaying their knife training, show their unique style of close-quarters combat. 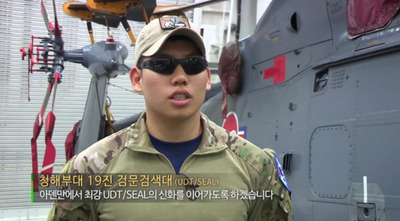 South Korean media reports that Korean SEALs have trained with the US’s SEAL Team 6 — the same group that took out Osama Bin Laden — to form an elite unit to take out North Korea’s Kim Jong un. In the slides below, see the Korean SEALs training in combat gear and practicing a fearsome knife-fighting regimen with blinding speed and complexity. The video starts with the Korean SEALs practicing their form in unison. Next, they go to one-on-one duels, which are lightning-quick and insanely complicated. The takedown on display here is especially savage. Then they do disarming and counter-attack drills.